WMF stands for Windows Metafile Format. Metafile indicates that this file consists of info that describes or specifies an additional file. WMF was launched by Microsoft. WMF saves room already-built comparing with bitmaps particularly when several bitmaps are utilized repeatedly by different elements with the running method or of an software. The WMF file was developed for a 16-bit running program. For 32-bit operating techniques Microsoft created an enhanced metafile format (EMF). Microsoft's clipboard (CLP) file may possibly contain an EMF file, a WMF file, or a bitmap format file (BMP). WMF (Windows Metafile) and EMF (Enhanced Metafile) are the core display formats of the Windows operating environment and the native graphics formats for MS Office applications. WMF is the long-standing 16-bit version and is prevalent across all 16-bit and 32-bit Windows platforms. EMF is the newer enhanced 32-bit format and is slowly gaining acceptance. Able to create lots of image formats. 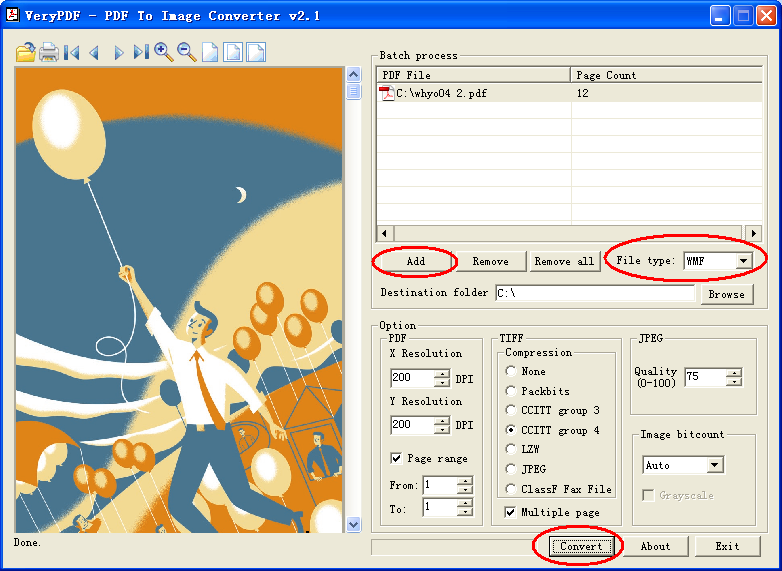 PDF to WMF Converter is easy to use, the PDF files can be added into file list and converted fast. Able to convert owner Password Protected PDF file to WMF format. Able to specify any resolution in the generated WMF files. It is a standalone software, Adobe Acrobat and Reader NOT required! It is support batch conversion, you can convert lots of PDF files to WMF files at one time. Able to create multipage TIFF files. Supports intelligent processing of large files. Supports conversion into 1, 4, 8 or 24-bit format. Supports for PACKBITS, CCITT FAX4, LZW, JPEG compression of TIFF images. Supports command line operation, you can call it from from batch file or other applications. PDF to WMF supports all version of PDF files.